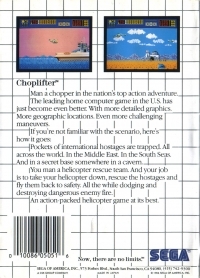 Box Text: Man a chopper in the nation's top action adventure. Pockets of international hostages are trapped. All across the world. In the Middle East. In the South Seas. And in a secret base somewhere in a cavern. You man a helicopter rescue team. And your job is to take your helicopter down, rescue the hostages and fly them back to safety. All the while dodging and destroying dangerous enemy fire. An action-packed helicopter game at its best! 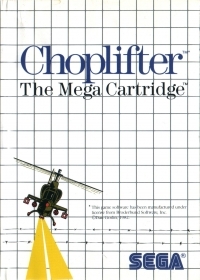 This is a list of VGCollect users who have Choplifter in their Collection. This is a list of VGCollect users who have Choplifter in their Sell List. This is a list of VGCollect users who have Choplifter in their Wish List.